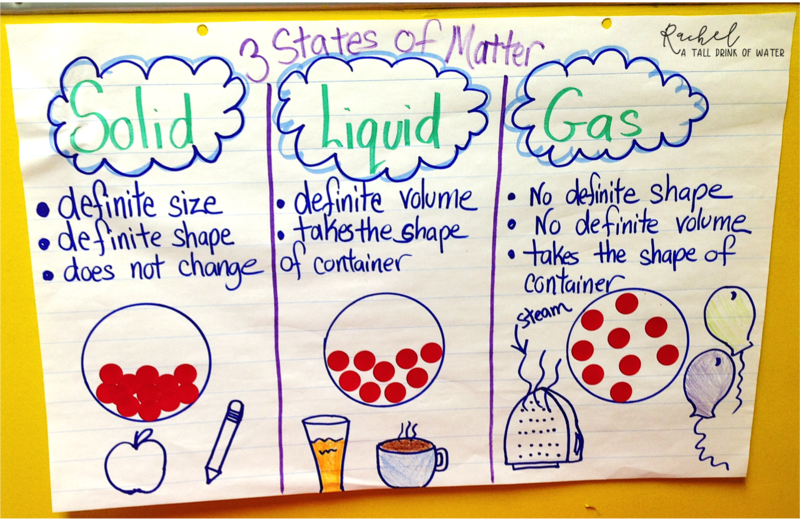 We have been super busy learning all about the states of matter!! 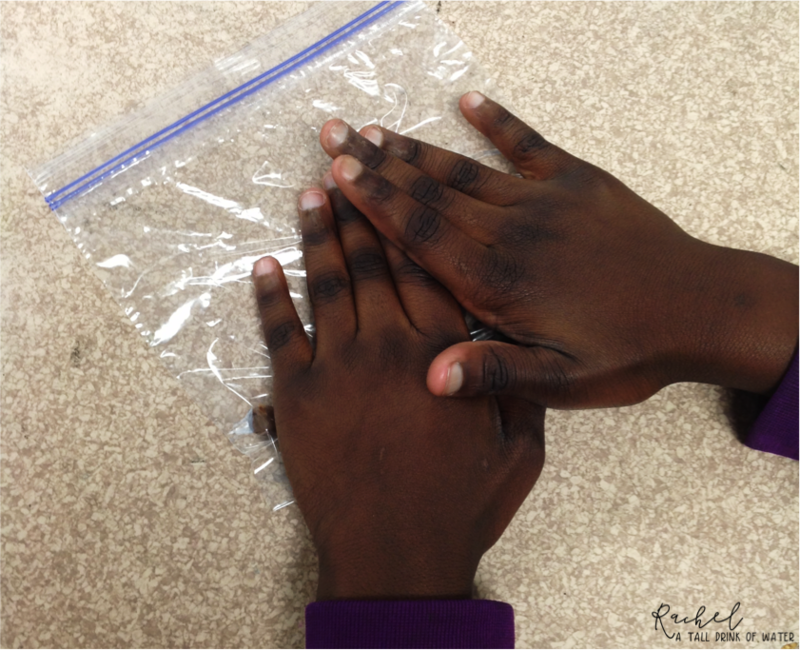 We did a couple of fun activities that were really engaging and the kids loved it! 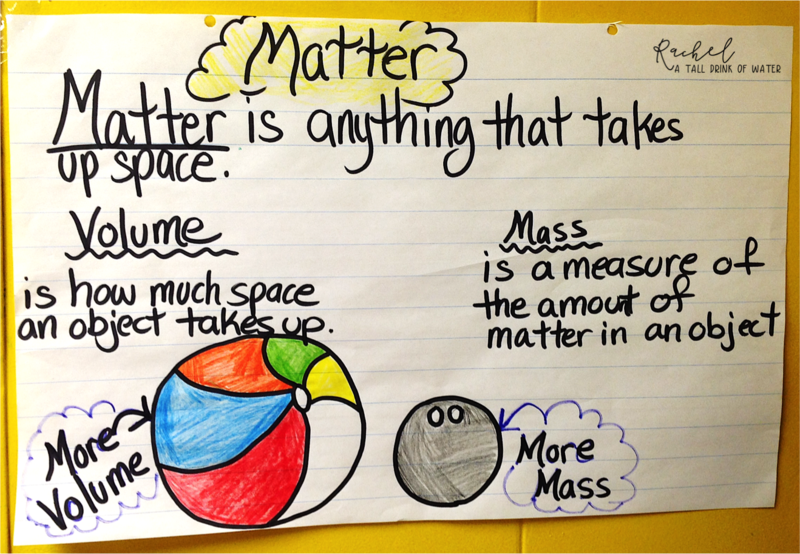 One of the first things we talk about is what is matter and what is the difference between volume and mass. 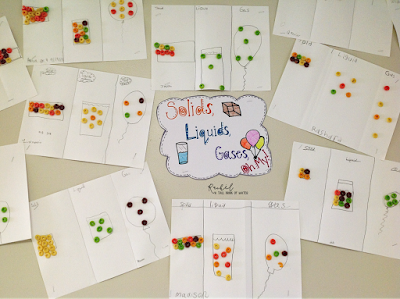 Then we discuss the definitions of solids, liquids, and gases and how their particles move in each substance. 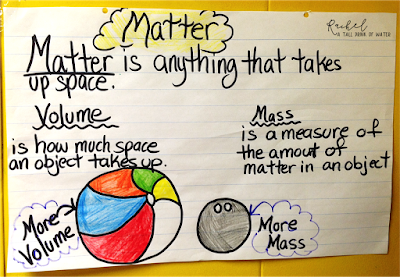 These anchor charts are actually from the teacher next door! Grab these posters for free by signing up for my email list! 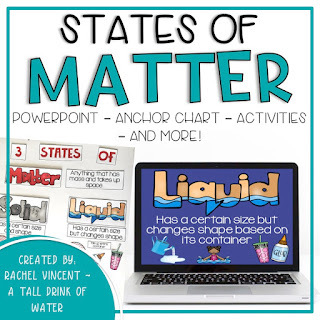 If you're already a subscriber, they are available in the resources library! 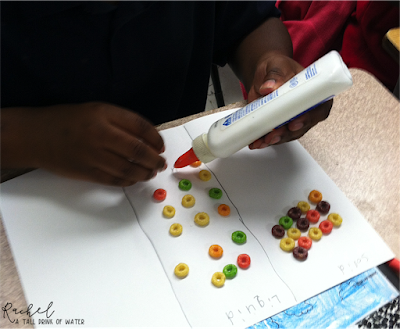 To help students understand this concept a little more, we do an activity using cereal to represent matter particles! 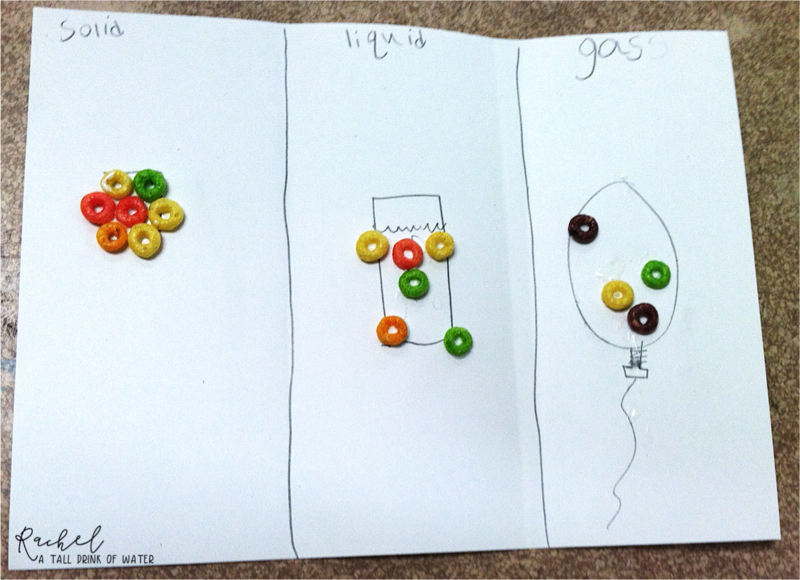 We used Fruit Loops, but any type of circular cereal would work! Here's an example of a completed project! Of course we displayed them outside our classroom for everyone to see! They were so proud of their work!! Then we did an activity with chocolate chips. 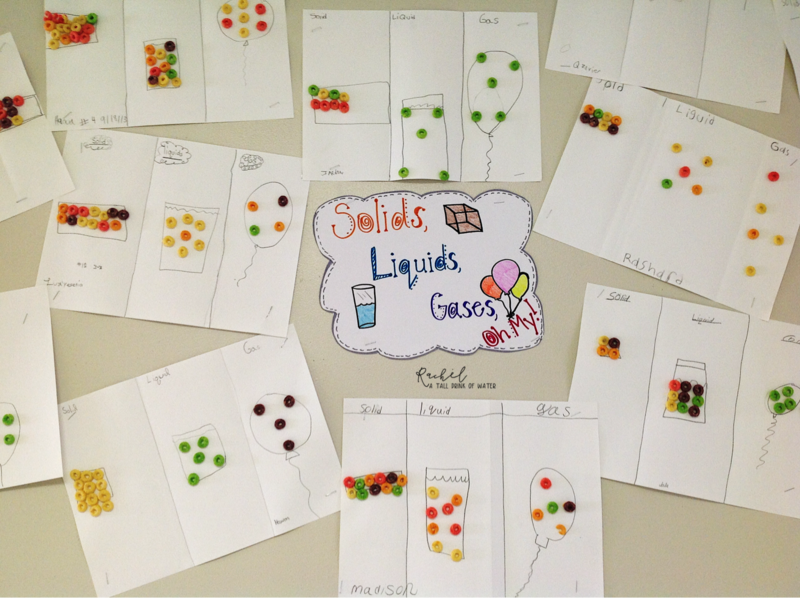 I wanted the students to be able to observe how solids change to a liquid and then back to a solid. 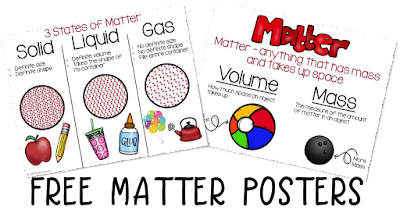 Part of our unit on matter also includes sources of heat, so I wanted to tie that into this lesson as well. 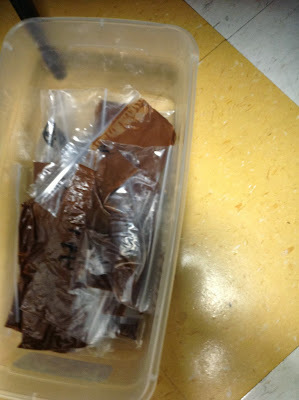 First, we tried to use body heat to melt the chocolate chips. Students each got a small bag of chocolate chips and used their hands to rub each bag. 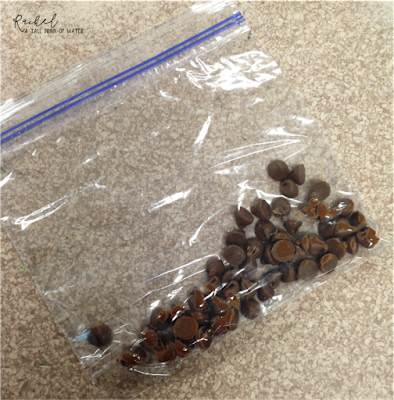 Next, I had students brainstorm other ways to melt the chocolate chips. Of course, several said we could microwave them (which would be electricity) or put them on a stove (which would be burning). 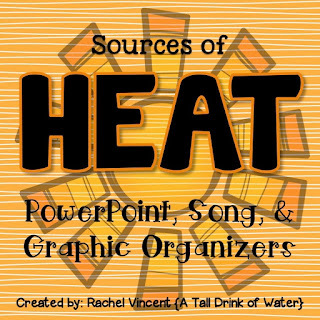 Since we didn't have access to either of these options, I had students continue brainstorming and finally someone thought of using the sun's heat! 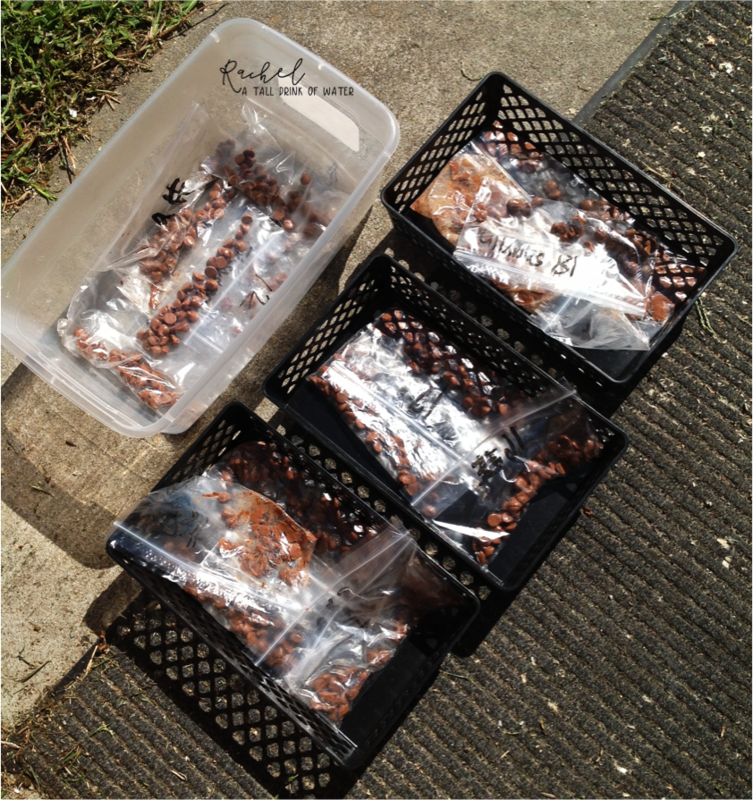 We placed our bags out in the sun for about 10 minutes...which worked perfectly!! 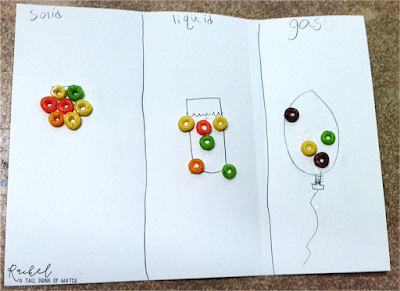 Finally, we discussed ways for our now liquid chocolate to turn back into a solid. And everyone agreed that putting it in the freezer was the best option. The next day...we had solid chocolate again! They got to eat their chocolate, which of course made it "The Best Day Ever!" Don't you love it when kids say that?! 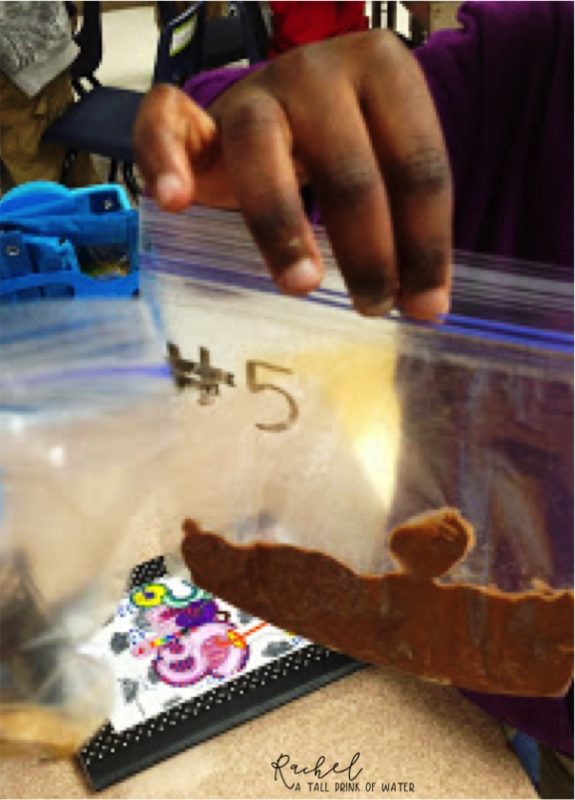 Chocolate Chip Activity found at Once Upon a First Grade Adventure. Yes, I DO love it when something makes my students say it's the "best day ever" - it just makes me smile. 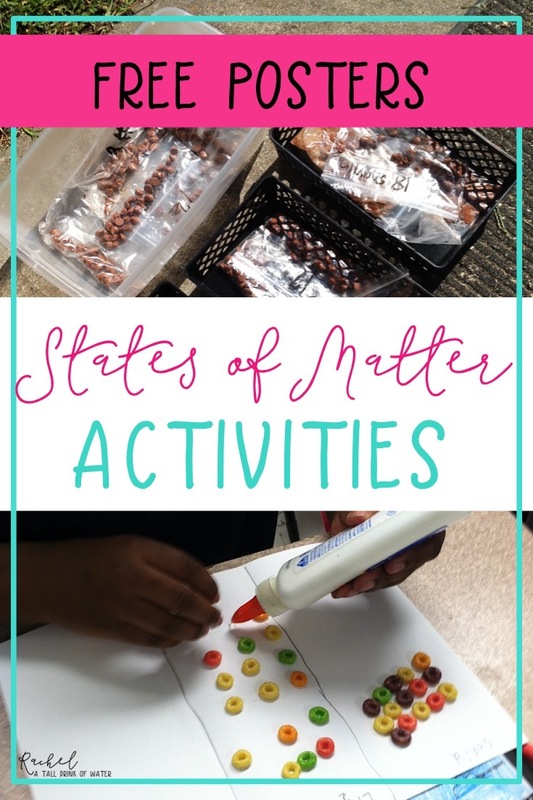 Looks like more learning fun is being had in your class! 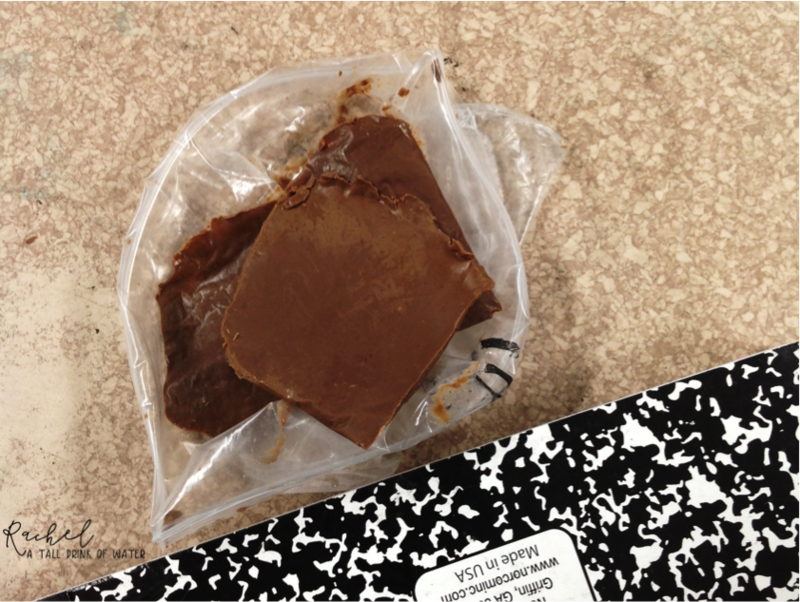 Love the chocolate experiment! What a great idea! 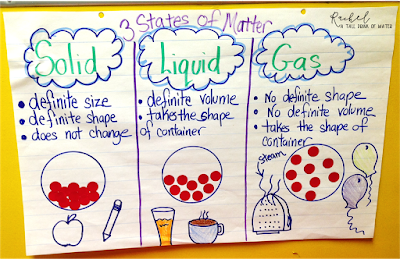 Thank you for sharing some great ways to demonstrate the properties of matter! I love the models made of cereal, and of course, you can't go wrong with anything that includes chocolate! Such a very cool activity! We teach this topic in the spring and I'll have to make a note of it. Who can resist chocolate? I love the chocolate idea too! Thanks for sharing your ideas! The chocolate experiment is great! What a great way to get the point across and when they are done they get to eat the chocolate!! It's a win, win!! Great post! I am going to have to refer back to this when we get to our matter unit! Thanks for the great ideas!